This very pleasing property in a panoramic position set in the hills north of Lucca, more specifically between the towns of Barga and Coreglia Anteminelli. The property consists of house on 3 levels; barn that has been renovated; barn used as storage for garden tools, chapel, pool and a sizable amount of land with meadow and woodland. The house circa 300mq and consists of ground floor – entrance, living room and dining room, that share double sided fireplace, bathroom with adjacent laundry area, kitchen and large lounge with a staircase that leads to the first floor. First floor – there are 3 bedrooms, bathroom with tub & shower and panoramic covered terrace. Basement area – these spaces have been informally used as living spaces with 2 kitchenettes, 2 independent entrances, 2 bedrooms and two bathrooms. Former stable has been renovated it is situated on 2 floors, the ground floor consists of one open plan space. First floor spacious bright room and bathroom. Both these buildings share the same heating system. Barn – these spaces are used as storage space for garden tools and equipment. Included in the sale is a private chapel renovated not many years ago. In the courtyard in front of the main house is a bread oven. There are 8ha of land populated with a vineyard of 101 Syrah vines, of various fruit trees and woodland. The property has a wood-burning heating system, there is also GPL gas, solar panels for heating water and photovoltaic panels that produce electricity. Included in the sale is an abundant source of drinking water. The furnishing and fixtures have been chosen with great care and complement elegantly the nature of the property. 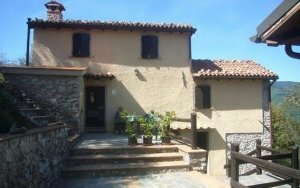 Property consisting of 2 independent flats, large cellars, barn, olive grove, pleasing gardens and pool, located near to Barga, Lucca. detached house set in own land near to the centre of Barga, LU. Artist residence with panoramic views in the village of Monte di Villa, near to Bagni di Lucca. Property set on three levels with large garden, aboveground pool and terrace, located in a panoramic position near Borgo a Mozzano, Lucca. Rustic property positioned in the village of Pescaglia, Lucca. Villa of approximately 500mq, set on 3 levels, with garages, *3000mq of land* and garden, located in Piazza al Serchio,in Garfagnana, Lucca.